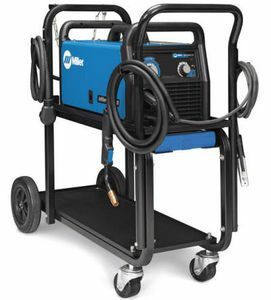 The Millermatic® 141 MIG welder with running gear and cylinder rack is a 140 amp portable MIG welder that runs on standard 120 volt household current. The 141 features Auto-Set, which eliminates the guesswork of setting voltage and wire feed speed for your MIG welding application. Simply select the material thickness and wire diameter while the welder is in the Auto-Set mode, and you are ready to weld. The Auto-Set control automatically sets your welder to the proper parameters. It is available when welding mild steel with solid wire and only works with .024 and .030 solid wires and C25 shielding gas (75% Argon, 25% CO2). The new Millermatic running gear and cylinder rack is made of heavy duty construction. It has eight inch rubber rear wheels for smooth running over most shop surfaces. It comes complete with front handles, cable holders and plastic consumables storage box. The cylinder rack will hold a single gas cylinder up to 7 inches in diameter and 65 pounds in weight. FREE Hobart® Fabshield® 21B 2 lb. 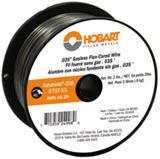 spool .030 E71T-11 flux-cored welding wire. Genuine Miller® Dual Cylinder Rack Conversion Kit for your Miller #301239 running gear. The Millermatic® protective cover protects the finish of your Millermatic® 141, 190 or 211 MIG welder. Also suitable for Multimatic™ 215 multi-process welders. Genuine Miller .024 MIG Consumable Kit for your Miller M-Series MIG gun. Suitable for use with Millermatic MIG welders. Genuine Miller .030 MIG Consumable Kit for your Miller M-Series MIG gun. Suitable for use with smaller Millermatic MIG welders. Genuine Miller .035 MIG Consumable Kit for your Miller M-Series MIG gun. Suitable for use with smaller Millermatic MIG welders. Can you use pre-mixed gas i stead of two separate tanks? Millermatic 141 MIG Welder With Cart 951601 will accept a single bottle of mixed gas instead of two separate cylinders. Can the door of the welder be opened while on the cart? You can open the door on the Millermatic 141 MIG Welder With Cart 951601while it is on the cart. what is the warranty on this machine? The Millermatic 141 MIG Welder With Cart 951601 comes with the Miller M-100 mig gun which is 10 ft long. Miller generally does not recommend installing a longer gun because of the extra strain it will put on the wire drive motor. That said if you need a 12ft gun you can order and install a Miller 249040 M-150 mig gun. This gun is priced at $150.95. You should not operate the unit with the cover on as it will cause overheating problems. I recently purchased a millermatic 141 from Cyberweld. It arrived quickly however had a small dent in the machine. Called Cyberweld and they took care of it immediately, had my replacement machine lightning fast. Great customer service. The prices are top notch and make it hard to find a better deal elsewhere. Thank you.